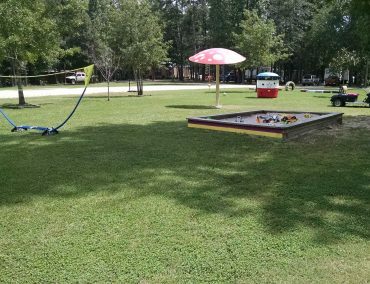 We have a small playground to keep the little ones occupied, volley ball and horseshoes for the bigger kids to play. Rock’n E RV Park is a terrific place to spend your next camping vacation. . Explore the beauties of the East Texas Piney Woods on more than 6 miles of nature trails at Rock’n E. These trails wind through the pine trees and along some of the most amazing ravines in the area. Some of the trails are an easy stroll through the peaceful woods while others offer more of a hiking challenge. . Along our nature trails you can enjoy bird watching, Geocaching, finding hidden treasures and so much more. If fishing is more your style we are only about 2 miles from Lake Livingston and Trinity River. Lake Livingston is more than 90,000 acres and has some of the best fishing around with largemouth bass, white bass, crappie and blue catfish. The fishing is good at any time of the year thanks to the mild East Texas climate.